So now that you're caught up on what's going on over there, I hope you understand the anger, sadness, frustration and rage over this situation right now. I mean I'm just past the point of being angry with the U.S. anymore because it's just a normal way of living. It's basically a big corporation. So with that being said, if it's not something in it for them, then they're not going to waste the assets. Now I don't have a problem with that per say, if they were consistent with the view of us handling our own and only ours. But they haven't, hell they get mad when Obama proposes stuff that will actually help the country out. 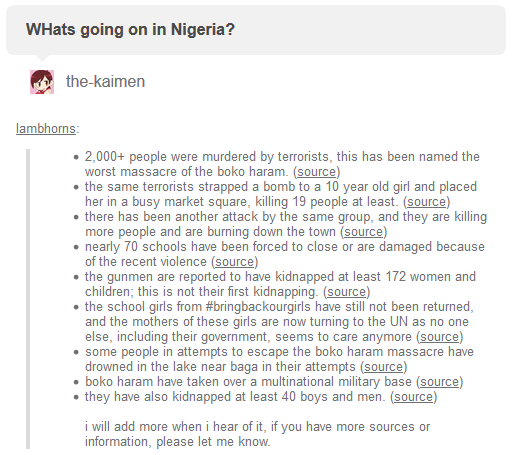 So when I see what's going on in Nigeria it angers me because I wonder what would it take for help to be given. I mean clearly they don't care about African Americans or anything resembling African decent. Because they were so quick to issue statements about what's going on in France but wouldn't release one for this or the multiple shootings in this country. I'm pretty sure that rolling out troops to go find and kill terrorists that are hiding in plain site wouldn't be hard. I'm not going to make that reach of saying that soldiers wouldn't mind going over there because most of the soldiers that actually do the heavy lifting have spent the last couple of years in Iraq and Afghanistan and they are stretched thin. That's why we need to better train our army and give them the best tools available so when things like killing 2,000 people in a day would be met swift action. I know we need to practice minding our own business and not risking the lives of soldiers, but if we don't stand up against injustice and protect the poor across the world and not just in countries that produce oil, then who will? I know they'll say that Africa should worry about protecting Africa, but how can they when it's ravaged, pillaged and left to become a wild west frontier in most of those countries. I just pray everyday that NATO or the United Nations steps in and tries to at least do something, but even that's a stretch because they can't do that much. This just makes me angry and sad that not even the slightest of press coverage is being committed to this, and a picture of burned bodies is being passed along twitter so easily. 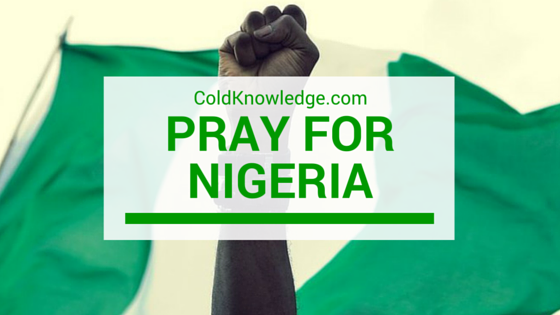 At this point the only thing you can do is pray because no one is trying to help Nigeria at all. It makes you wonder about what's really important in this world.